There’s still some big slug yellowtail north of La Paz where the waters are cooler. 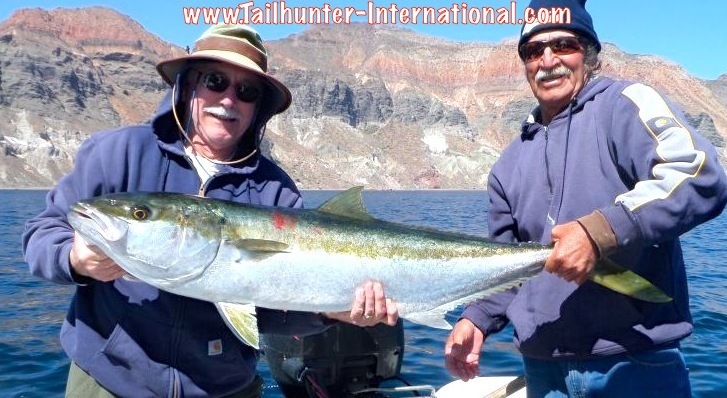 The fish are varying in size from 5 pounders to larger 20, 30 and 40 pound models like this great fish taken by our amigo, Grant Darby from Washington with a live mackerel and the photo assist from Captain Alfredo. Even if live bait is available, one of the most effective methods of working the reefs and rocks with slow trolled crank baits like the one hanging out of the mouth of this nice cabrilla. 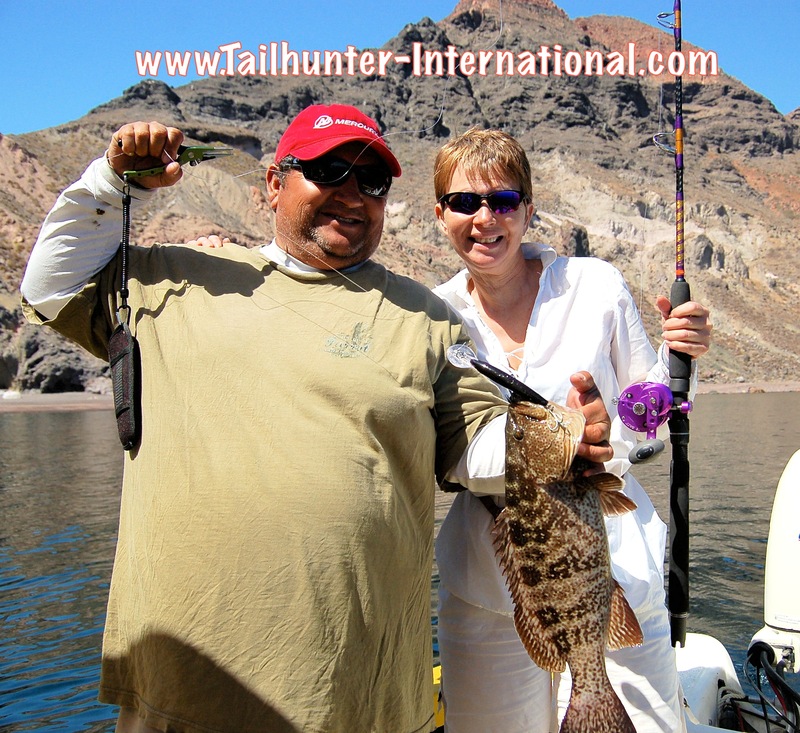 Becky Solee from Tigard OR and her husband, Bob, are frequent visitors to us in La Paz and own B & B Custom Fishing Rods. Becky us using one of their popular custom-made “Chix Sticks” and she poses with Captain Rogelio. Our amiga, Verda Boyd, usually visits us in December and she catches…sierra! She came to visit us in April and she caught…MORE sierra! She’s holding a nice pair here while standing on the beach at Bahia de Los Muertos! Take a look at this monster African pompano! 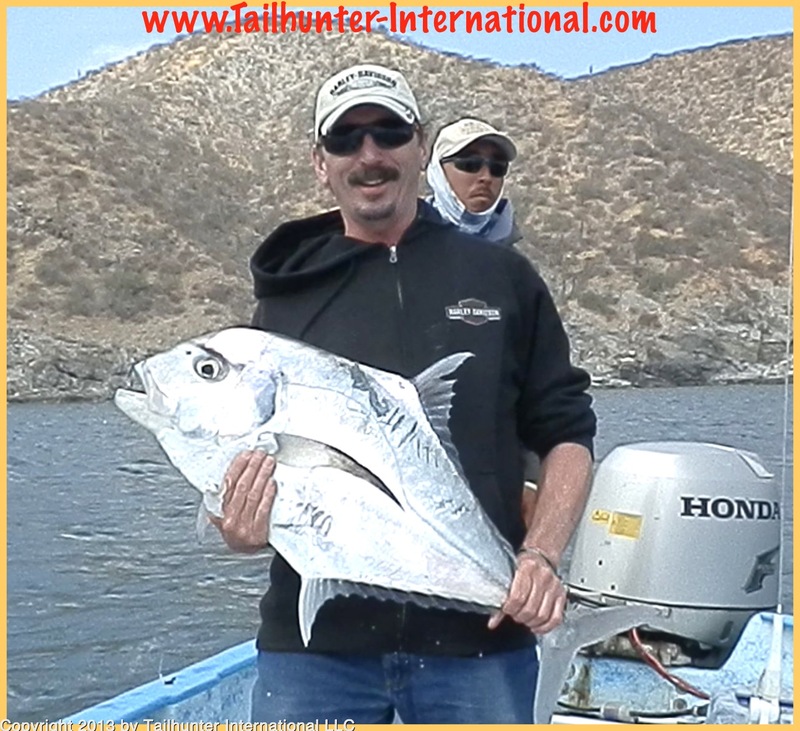 It’s the largest any of us have ever seen taken in all these years and it was caught by Faron Kilber from Canada on his first trip to check out the fishing with us in La Paz. This fish was so big, we actually ran to check the IGFA record books. You can tell it’s a bit chilly by the way even Captain Afredo is dressed along with Carol Darby…and she’s from Washington and used to chillier temps! But when it’s windy it’s good to have a jacket! 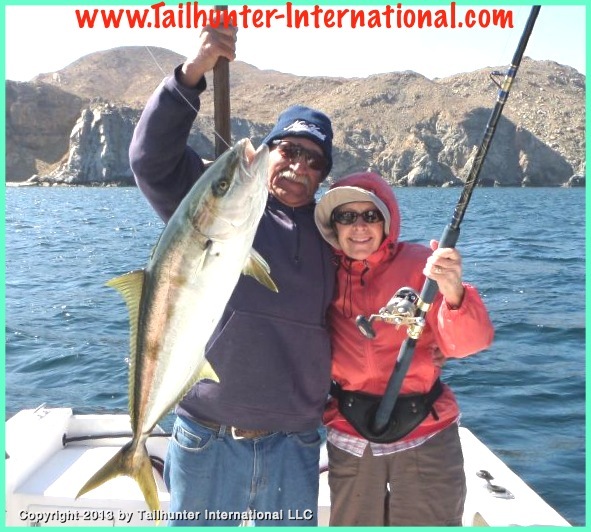 Carol stuck it to this fat yellowtail off Espirito Santo Island. When it’s one of your first fish ever and your first time visiting La Paz and first time fishing on the ocean, it’s a good day to smile! 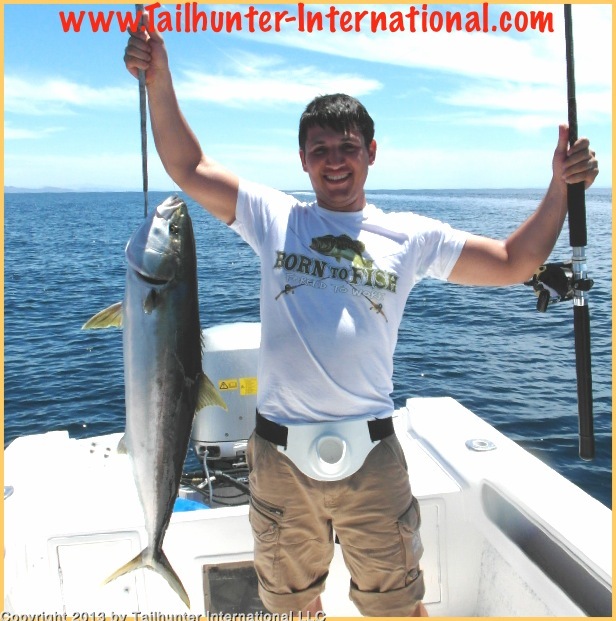 Alex Babadzhanov is originally from Russia but living in Seattle a the moment for work and got into some nice yellowtail as well! He says he’s now hooked on Mexico and fishing. Another illustration of the variety of fish right now…take a look at Pete Benneke’s pair of dorado. Normally warm water fish! Pete’s from Canada and the dorado usually start to move in this time of year but we don’t see numbers until the waters warm up. However we did get a big 40 pounder late in the week! A scattered week of fishing dictated pretty much by what the wind does and this week it was pretty windy. When the winds aren’t blowing, we’ve got dorado, a smattering of tuna, yellowtail, jack crevalle, rooster fish, pargo and cabrilla all in the mix. But, when then the winds blow, as they do this time of year when we transition between cooler and warmer weather plus we’re affected by all the cold weather in the U.S., all we can do is either move days of fishing or find spots where the winds aren’t blowing as much. Often that involves hugging the reefs and shorelines or ducking into coves to find fish. It’s not all bad, as there are still bunches of yellowtail, pargo, cabrilla, jacks, and sierra in the spots. There’s a whole bunch of variables at play. 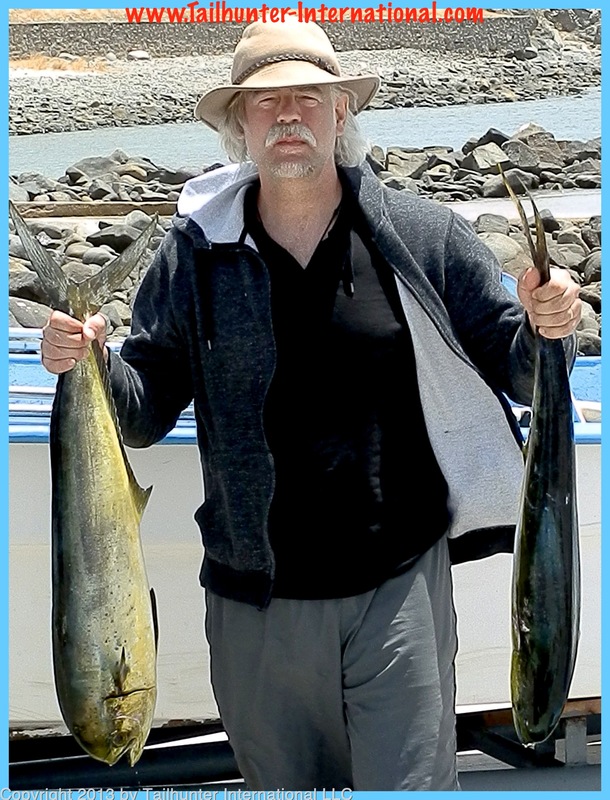 At the end of last week, the winds started to diminish and fishing reflected that with an upswing in yellowtail, sierra and other species. But, even as the winds died, the warming of the waters brought with it an algae bloom turning waters green mixed with the cooler waters brought up from the deep channels by the winds and there wasn’t a lot swimming around in the dark green. But, if you found the clearer waters that were blue, there were all kinds of things swimming and willing to bite a line! Finding the area was the key. Then, mid-week the winds kicked up again and it was just as well to put your feet in the sand and watch the world go by from the beach. Not worth fishing. Too many waves. Too much rough water. No bait. 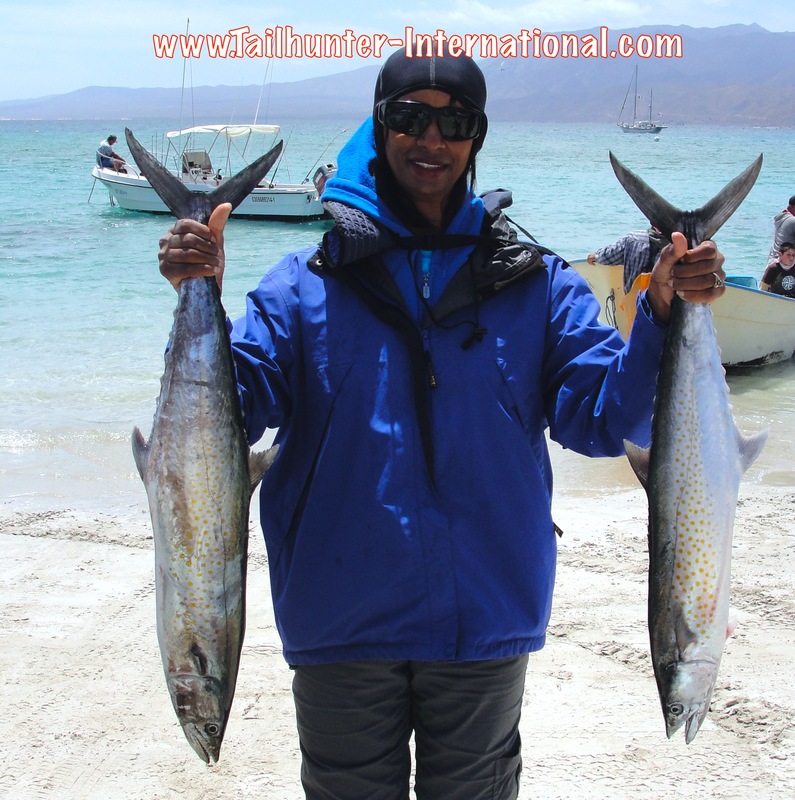 By the weekend, the winds came down again, but we had to wait a few days for the green water to clear and sure enough, the pargo, cabrilla, dorado, yellowtail and other species started biting. By the time you’re reading this, we’ll be into another “cycle” again. That’s the way it is this time of year. On the good side…there’s sure a lot of different species biting. I counted 15 different species last week! But with each passing week, the waters get a little warmer…the the winds drop down an little more…And fishing gets better!